Celebrity Cruises - Just Cruises, Inc. Imagine what it feels like to turn 360 degrees and see nothing but mesmerizing ocean and majestic scenery, or to rise to the wonders of a new destination each morning. These are moments that can only be experienced on a cruise. With Celebrity the exceptional level of personal service, award-winning cuisine, world-famous amenities and accommodations that are the most spacious at sea, not only ensure an unforgettable cruise experience, but forge a lasting relationship with its guests. Celebrity Guests & Travel Magazines, Rate Celebrity Cruises As One Of The World's Finest Cruise Lines. Aboard Celebrity, you'll find unlimited opportunities to indulge your interests. Attend an informative onboard lecture or food pairing class, discover unique treasures in upscale boutiques or collect fine pieces of art during an onboard auction. The lavish Vegas-style spectaculars promise extravagant entertainment for all, or try your luck in the exhilarating casino. Then take in the non-stop, high-energy of the nightclubs and lounges. In pursuit of a slower pace? Sink into the welcoming arms of a leather club chair and listen to the sounds of a grand piano in the refined atmosphere of Michael's Club. 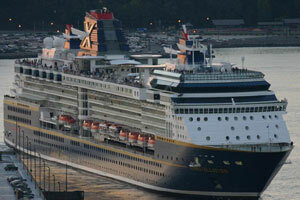 The array of entertaining options will ensure a most delightful and distinctive cruise experience for everyone. No detail is left to chance. And Celebrity Cruises award-winning fleet of Solstice class of ships redefines premium cruise travel. With spaces designed to enhance even the most breathtaking natural scenery, Celebrity shows you the world from a perspective that rivals the sights themselves.